Down 3-0 to start the third period, the Nashville Predators would not go quietly against division-rival St. Louis. The Preds got two goals from Austin Watson and one from Calle Jarnkrok to turn a three-goal deficit into a tie game heading into overtime. Just 1:19 into the extra period, Preds’ forward Filip Forsberg became just the 13th player in NHL history to score a game-winning goal on a penalty shot in overtime in the regular season, and just the second player in Preds history to score on a penalty shot in overtime – David Legwand was the other. Nashville has points in its last seven games, including five straight overtime games. Goaltender Pekka Rinne is largely responsible for both. 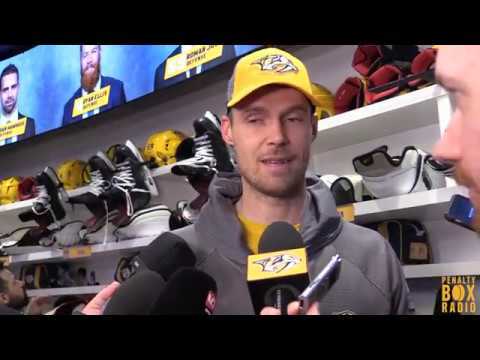 Rinne, who picked up career win No. 298, hasn’t lost a game in regulation since Jan. 2 against the Vegas Golden Knights. He saved 28 of 31 shots against the Blues, keeping the Preds in the game long enough for the Preds offense to stage a comeback. Watson snapped a 13-game scoring drought. His last points came against Los Angeles back on Jan. 6, also a two-goal performance. “He got into the hard areas,” Laviolette said. “We talked about that. Their defense is so big and they do such a good job in front of their goaltender that it makes it difficult to find those situations. You really have to pay the price to get their interior, and he did. Blues goaltender Carter Hutton entered the game 10-2-1 in his last 13 starts dating back to Dec. 30. Nashville is only the second team to score at least four goals against Hutton during that span. In addition, the Preds put more distance between themselves and the Blues, who are now five points back of Nashville, who has four games in hand. “The division is probably going to determine the outcome of the league, and the conference, and these games really matter,” Forsberg added.